Today's press conference will be streamed live. Here's the link. More updates below..
Jack Parker, whose name is synonymous with Boston University Hockey, will announce his retirement tomorrow as Terrier head coach after 40 seasons behind the bench. The BU athletic department has called a 3 p.m. press conference at which the legendary coach will make it official. Parker, who next weekend will guide the Terriers in a quest for their eighth Hockey East title, has three NCAA titles, 11 conference titles and 21 Beanpot championships on his resume. He assumed the head coaching duties in December of 1973 and led BU to the NCAA Final Four each of his first five seasons, including the 1978 NCAA title team. 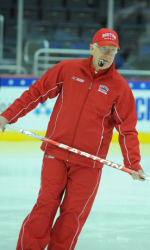 He has received the Spencer Penrose Memorial Trophy as NCAA Coach of the Year three times, most recently in 2009. There had been speculation about a retirement announcement a week ago when Parker’s four decades as BU coach were recognized between the periods of the BU-Vermont game. Among the names prominently mentioned as a potential successor: BU associate head coach Mike Bavis, Colorado Avalanche coach Joe Sacco, Avs assistant and former BU associate head coach David Quinn, New York Rangers assistant Mike Sullivan and Wilkes Barre/Scranton (AHL) head coach and former US NTDP head coach John Hynes. ►Arielle Aronson, who covered BU for the Daily Free Press for three seasons, discusses her relationship with BU Hockey and Jack Parker for a She's Game Sports blog post now posted on Boston.com . ● Denver Post: Avalanche coaches tempted by BU job?